On a humanitarian mission to fly doctors to a remote village in Mexico, pilot Lisa Merrick discovers something sinister lurking behind the organization in charge. Her plane is sabotaged, leaving her trapped in the Mexican wilderness with a price on her head and no way out. Injured and desperate, she contacts the one man she knows will help her: Dave DeMarco, a tough but compassionate Texas cop with whom she was once wildly in love. Dave DeMarco is stunned when a woman from his past calls him late one night with an incredible story of smuggling, sabotage and attempted murder. Soon, though, his mission to rescue Lisa becomes a struggle for survival against an enemy who wants them both dead. When the danger they face clashes with the passion that still burns between them, Dave vows to protect the woman he never stopped loving – and keep her in his life forever. 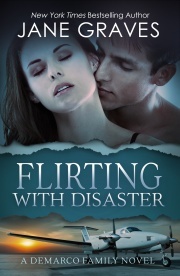 Did you know that Flirting with Disaster and many titles are available digitally from Tule's own bookstore? Check it out!